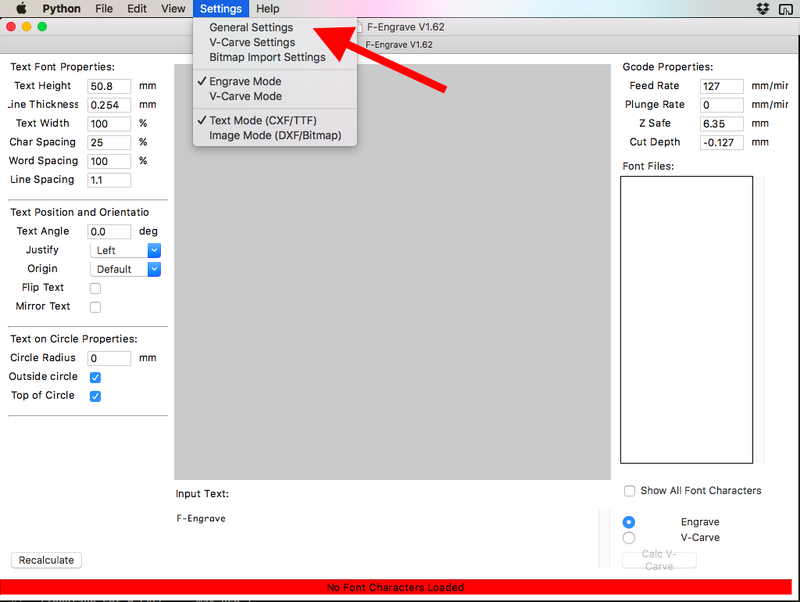 Inside F-Engrave's G Code configuration area, get rid of the G64 and P0.001 commands. FYI I used to have a Z move command in my configuration so the spindle doesn't start while touching the stock surface. I don't remember if you need to add a Z move command when using Easel. Update: If this is still too confusing, use the other two options like already mentioned! Is it just me or does F-Engrave run R E A L L Y - S L O W L Y on a mac? I watch the tutorial vids and his PC version seems to scream through the V-Carve plotting whereas mine just sort of plods along at its own pace. I've not no slouch of a machine, it's an 3.4ghz i7. I'm thinking it's just XCode being slow. I also see a lot of weird font errors in the interface. Words break out of dialog boxes, or only the top half is in the button or visible. It's like the text is too big for the interface, but moving the window boundaries doesn't do anything to fix it. It seems like it was built to use a different native font than what OSX uses. F-Engrave tries to use "psyco" for speedup. Don't know if psyco is available for mac. It is also unmaintained. Maybe the script could be improved with pypy for all platforms. Any python pros out there? @ChristianSonntag Sweet! That worked. Thanks for the support. 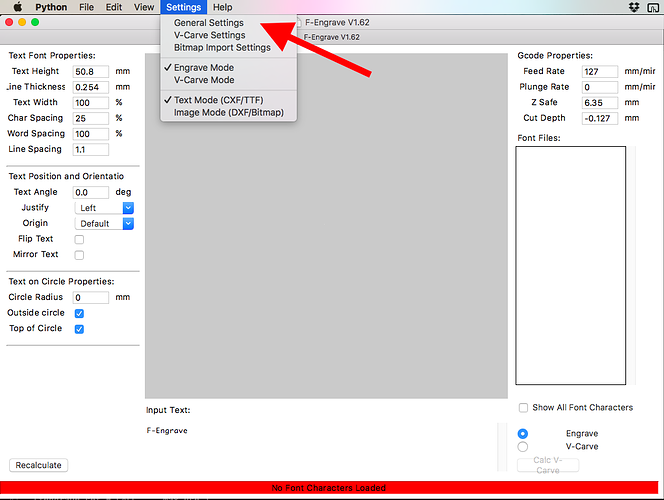 I can get Fengrave to run, but I can't get it to use PNG files (and it doesn't read my text from the DXF files from Inkscape). I don't know enough to figure out how to make this work on my Mac...? PNG files probably need an auto-tracer installed. 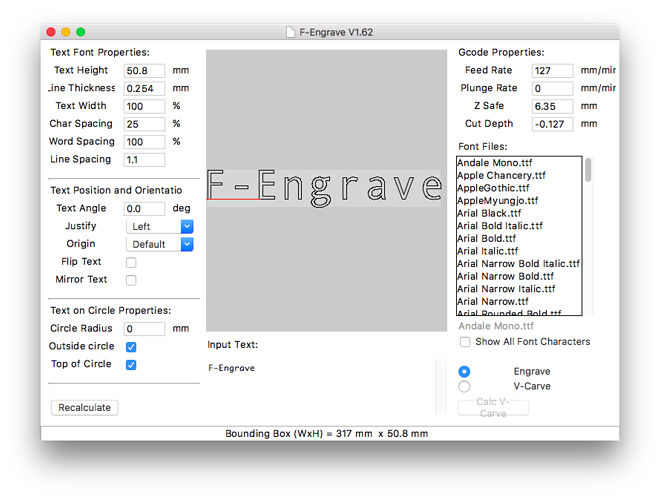 Text in DXFs would require the exact me font to be available to both the DXF app, and F-Engrave — I just made a custom font and did the cutting from that. 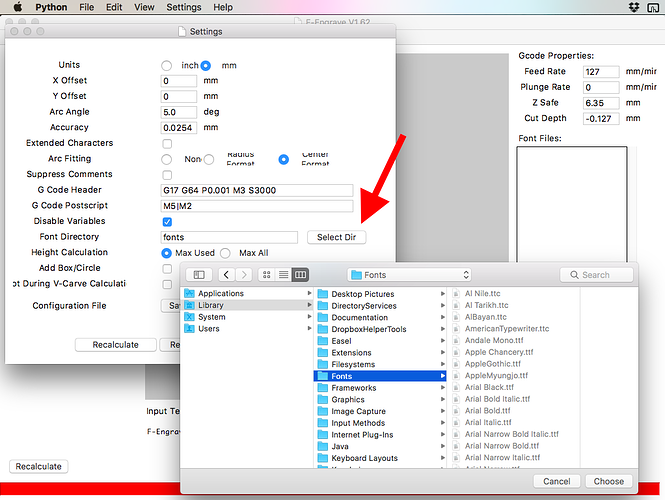 I found that using Pixelmator I can export to a BMP file and F-Engrave will open that. I also didn't have any luck with PNG files but I didn't put much effort into trying to get them to work. For the few carves I had to do it was easier to convert my image to BMP. Hi. I have made a bundled macOS app with all needed files in it using Playtypus. 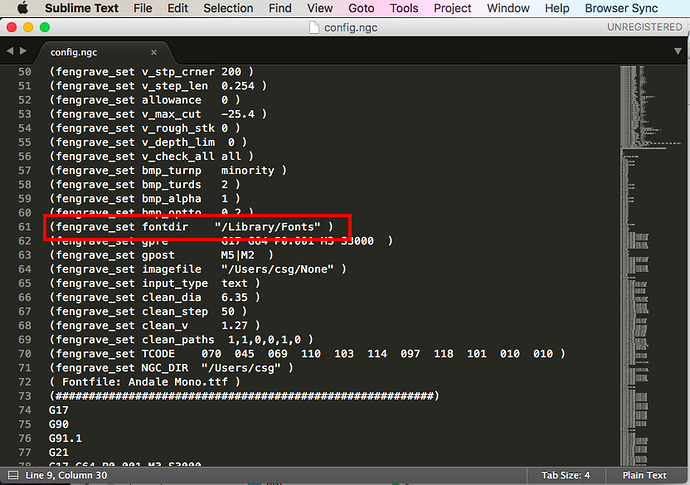 Included is the current f-engrave-162.py python script and all compiled binaries (potrace & ttf2cxf_stream). Hi. Open the settings window. 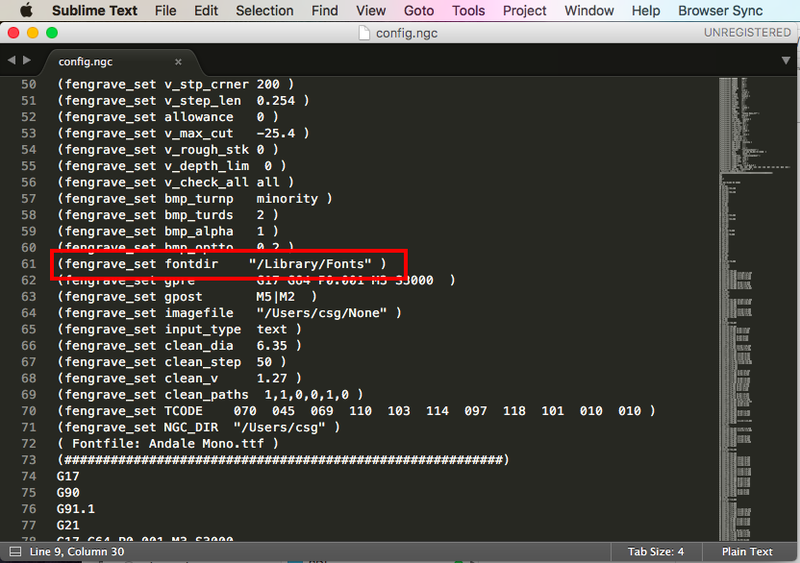 There you can define where the fonts are located, normally under /Library/Fonts. Another solution is to edit the config file under /Users/YOURUSERNAME/config.ngc. I had that same error on my work Mac yesterday. Just tested today on my Mac at home and it let me save the fonts. Will potentially test the terminal stuff on my work computer if I have time to see if it'll resolve the issue for me there as well. But thanks for putting this together @ChristianSonntag ! Worked great for me (including the fonts), thanks for packaging it together.